456' by 58' by 26'6"
Modification Late 1942: Converted back to oiler with capacity of 8000 tons of fuel oil. The Notoro was completed in 1920 as an oiler. She was later converted to a small seaplane carrier, capable of operating six E8N "Dave" seaplanes with two more disassemble airframes in reserve. Reconversion to an oiler was already started before war broke out, but she apparently continued to be used as a seaplane carrier until at least January 1943, when she was badly damaged by torpedoes from Gar. 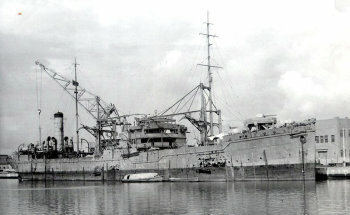 On 5 November 1944, she was badly damaged by aircraft near Singapore and was used as a floating oil storage vessel for the remainder of the war.